Dezeen promotion: Dutch manufacturer Hakwood looked to "curves and right angles" for the design of three new wall tiles, which can be used to create patterned walls. Hakwood has added three uncomplicated geometric designs – featuring repeated squares, interlinked circles and trapezoidal shapes – to its wall-tile collection. The tiles are available now and have been used by Dutch interior designer Timo van Riggelen to overhaul his Amsterdam showroom. Intended for use in both residential and commercial projects, the geometric tiles come in a variety of colours. They can be arranged to form patterned headboards in bedrooms, feature walls in housing developments, or to outline display spaces in shops. "Our designs are purposely uncomplicated. However, the proportions have to be right to make a simple design resonate," said Adriaan Hoogendoorn, technical specialist at Hakwood. "Through the choice of colour placement, many unique patterns emerge from a single tile design." 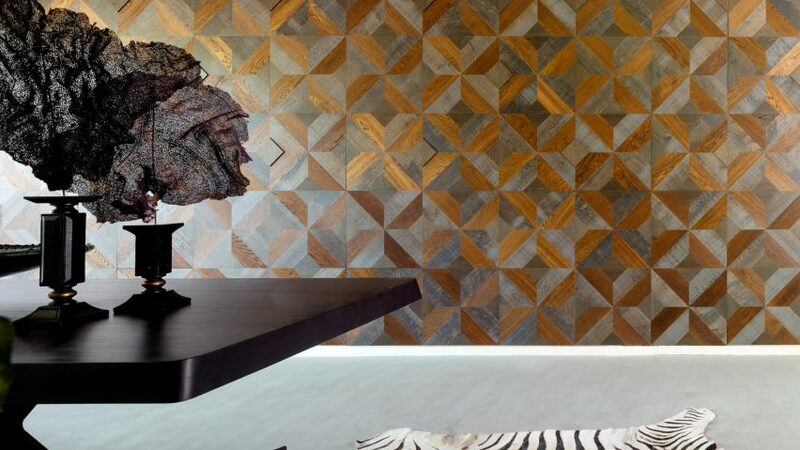 Using Hakwood's online customisation tool, architects and designers can experiment with the colour of their chosen tile and make bespoke designs. Each of the tiles are also available in two thicknesses, 15 or 20 millimetres, meaning that walls can be enlivened with 3D surfaces. Hakwood is based in the town of Werkendam, the Netherlands, and has specialised in the production of wooden flooring and wall tiles for almost 40 years. Most recently the brand teamed up with interiors company Shape London to create an installation for Clerkenwell Design Week, which featured three-metre-high Dutch townhouses crafted from bright-pink tiles. In 2016, the brand collaborated with Flea Folly Architects to create a temporary timber tunnel within the arch of London's St John's Gate, referencing the location's monastic past. To find out more about the tile designs, visit Hakwood's website.